As Syria creeps into total anarchy, rebels insist Israel will remain an enemy after the expected fall of Assad. Obama says Assad must leave. As Syria creeps into total anarchy, rebels also insist that Israel will remain an enemy after the anticipated fall of Syrian President Bashar Assad. President Barack Obama told the G-8 Summit Saturday that Assad must leave. Rebels claimed on Sunday that they killed senior Assad aides, but the regime denied the report and also accused “terrorists” of suicide bombings. The report of the assassinations was published by Al Jazeera, which quoted rebel leaders as saying they assassinated Assad's senior military leader, the Interior Minister and one of his top aides. The regime immediately called the reports “lies” and released an interview with one of the supposed assassination victims. Anarchy, if not civil war, is overcoming the country. A suicide bomb hit near the government’s intelligence complex Saturday night, with the regime and the opposition accusing each other of carrying out the deadly attack. The target area was the same place that once was a transit station for terrorists fighting American forces in Iraq, indicating that the attack may have been carried out by Al Qaeda-linked groups. 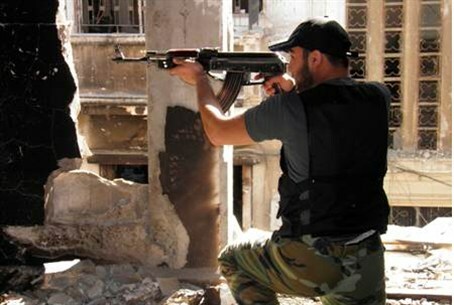 Assad until recently had been gaining the upper hand in the brutal suppression of the 14-month-old rebellion, but Gulf States and the Syrian Muslim Brotherhood have begun arming the opposition. The Obama administration has denied it is arming the rebels but has said it is coordinating with other countries that are sending them arms. The administration has totally reversed itself, having called Assad a “reformer” a year ago and now saying that he must leave power. If the future of Syria works out according to President Obama’s plans, anarchy is likely to reign. The president told G8 leaders at Camp David on Saturday that the Arab Spring revolution in Yemen has shown that political transition can work, according to deputy national security adviser Ben Rhodes. However, Al Qaeda terrorists already have taken over a significant part of southern Yemen, and at least 34 people were killed Saturday in clashes with the terrorist organization’s fighters. Al Qaeda also is operating in Syria, presenting the possibility that if and when Assad falls, the terrorist organization will be looking down on Israel along the Golan Heights border.